True story: I once had a woman in a workshop who put her camera in Continuous mode and every time she clicked her shutter, she held it down and waved her camera in the general direction of a scene until the buffer was full. When I asked what she was doing, she said, “There’s bound to be a good one in there somewhere.” We were in Yosemite, so I couldn’t really disagree with her. But I’m guessing she wasn’t seeing a lot of growth as a photographer. I tend to fall on the other end of the photography spectrum. Rather than a high volume of low-effort images, much of my photography style carries over from my film days—back then, a photographer who wasn’t careful might return from Europe to find that the photographs cost more than the trip. With our wallets forcing us to be more calculated and discriminating with our captures, we took our time, checked and double-checked our compositions and settings, and relied much more on our tripods. Times have changed. While every film click costs money, every digital click increases the return on our investment. So far, so good: Combined with a histogram and instant review, digital shooters can click liberally, secure in the knowledge that each shot can be better than the one preceding. But I fear that this great benefit digital has bestowed, combined with powerful processing capabilities, has engendered a “shoot now, think later” mentality among many photographers. Rather than taking advantage of digital’s instant feedback to ensure that everything’s perfect at capture, these photographer adopt a high volume approach that sometimes hits a bullseye, but does nothing to improve their aim. While there’s nothing wrong with lots of clicks, to advance your photography, each click needs a purpose. That purpose doesn’t even need to be a great image, it can simply be an I-wonder-what-happens-if-I-do-this experiment. Or it can be an incremental approach that begins with a “draft” and works toward perfection. On my recent snow day in Yosemite, I tried to highlight locations a little off the beaten path (as much as that’s possible in Yosemite). One of my stops was along Southside Drive, a little west of the crossover (to Northside Drive). Traipsing through wet snow, I made my way through the trees down to the Merced River. Bounding El Capitan Meadow, here the river widens and slows, as if gathering strength for its headlong charge down the Merced River Canyon. The relatively open views and leisurely pace of the Merced River at this spot makes this one of my favorite place for full reflections of El Capitan. Ever on the lookout for juxtaposed disparate elements, I didn’t have to venture too far upstream before the collision of autumn leaves and winter snow stopped me. Parallel yellow and white, El Capitan reflection, towering evergreens, snow-etched oaks, swirling clouds, all against a granite background: I knew there was a shot in here somewhere, and I was going to work these elements until I found it. To identify the shot, I started with an initial, “rough draft” click, then stood back and critiqued my result. With that frame as a foundation, I made incremental refinements, adjusting individual aspects rather than trying to fix everything at once: My horizontal orientation became vertical to highlight the (more or less) parallel snow and leaves; I determined the lowest f-stop that would ensure front-to-back sharpness and carefully refined my focus point, selecting leaves about a quarter of the way into the frame; I shifted slightly left to avoid merging the snowy log with El Capitan’s reflection; and finally, I tweaked the borders slightly (micro-zooming and -widening) to ensure that no significant visual elements were cut off. With everything set, I watched the shifting clouds and clicked when they did something interesting. I was satisfied after about a dozen frames—far more than I could have afforded in my film days, but a far cry from my workshop student’s machine gun approach. No doubt she’d have gotten something I didn’t get, but I like this one. I bet I had more fun, too. 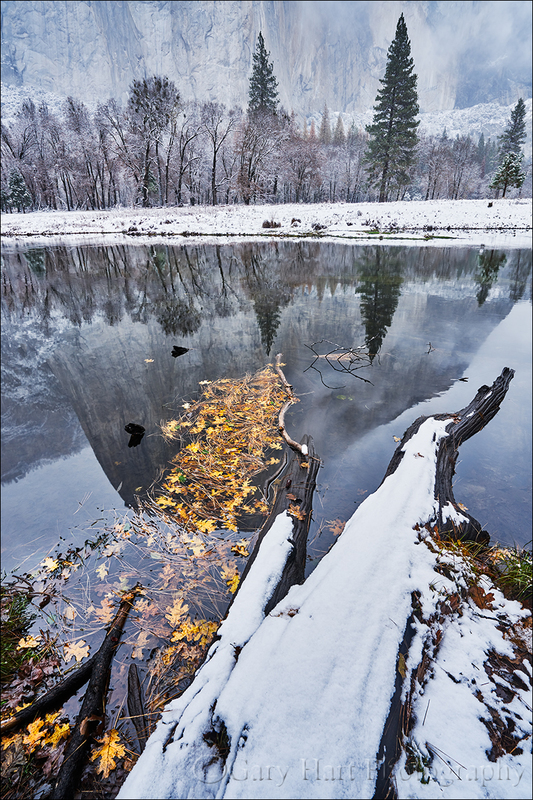 Love your work, Particularly your Yosemite winter series. been following you for some time. I’m also a Sony a7rII owner with various lenses. Would you be kind enough to tell me what your camera kit consists of. Thanks, Bob. I shoot Sony: a7RII, a7SII, a6000, and Sony FE 16-35, 24-70, and 70-200 lenses, plus a Rokinon 24mm f1.4 for night. I also have a couple of Canon-mount lenses that I use with a Metabones adapter in certain situations. Similar kit to mine, however your results suggest I need to spend more time to get to know my subject matter . You certainly know your chosen landscape extremely well. These are some of the most gorgeous, wonderful photos you have assembled for one session. They make me want to move to the area and visit as often as you do — and expand my capabilities –lots of work there. I love your approach of getting photos to your camera sensor and i think this is what differntiates people who do all for the fame and people who do it with passion. I love your work and hope we’ll see more fantastic shots in 2016 from you! Beautiful pictures. I just started last year trying to follow a dream and doing landscape pictures are my favorite to take. I’m still learning, but hope to one day capture images as you have. Thanks for sharing and for the information. Thanks for consistently producing thoughtful and well-written blog posts-and congrats for the nice article you wrote for the latest issue of Outdoor Photographer. Heeding the advice that you give to all of your readers and photo groups, I tried to do more thinking than clicking on your Eastern Sierra 2015 workshop last October. Overall, I came home with a nice set of images, but I did produce some duds as a result of falling back on some bad habits. Since I have three photo workshops planned for 2016, I will continue to read your blog and study your images as part of my mental preparation. A workflow question: in addition to the Sony a6000, I now have the a7rII and was wondering if you have ever used Capture One Pro to process your Sony files? From your experience, is ACR in Photoshop or Lightroom sufficient for converting Sony RAW files, or would the Capture One RAW converter make a noticeable difference? BTW, the a6000 files looked great in my usual workflow of Lightroom + NIK. Hi Julie. A few weeks ago I spent about a week trying to get up to speed with Capture One Pro. I came away with lots of positive thoughts about the interface and image quality, but eventually couldn’t get around the lack of a History pane. Clearly other users manage it fine, but for my workflow it was just unusable. I actually e-mail them and got a reply, but the best they could suggest was to create a Variant (snapshot) that I could return to, but I found that solution pretty much useless for me. My overall approach is if it’s not broke, don’t fix it—if you’re happy with Lightroom, there’s no reason to change.